Charmin® Basic is softness, strength, and value rolled into one! Our 1-ply toilet paper is a great balance of Charmin softness and strength and is affordably priced to suit most budgets. Outstanding quality and softness. Safe for sewer and septic systems. White, unscented 4.3 x 4.4 sheets. 352 sheets per roll. 8 rolls per pack. 5 packs per case. The brand you know and trust. 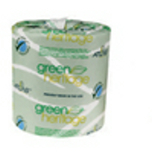 This tissue offers the soft, plush quality that you expect at home. Two-ply. White, 4.09 x 4.0 sheets. 506 sheets per roll; 60 rolls per case. • Soft, white, biodegradable • Individually wrapped rolls • EPA Compliant for minimum post-consumer recycled fiber content 1,210 sheeets per roll. 80 rolls per case.